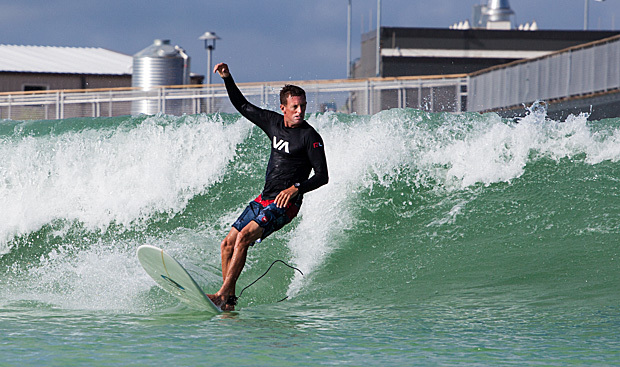 Surf’s Up at Austin’s NLand Surf Park! When you think of Texas, chances are you don’t picture crystal clear ocean waters and world-class surf. That’s all poised to change with the emergence of NLand Surf Park, North America’s first surf park of this kind, which opened to the public Friday, October 7th. Whether you’re a lifelong wave rider longing to get back to your first love, or a novice looking to upgrade from boogie boards and kiddie pools, NLand promises an exhilarating and decidedly unique experience for folks from all walks of life. NLand Surf Park is a labor of love conceived of and helmed by Doug Coors. An engineer and diehard surfing enthusiast, Coors meticulously plotted what would eventually become NLand over the course of 20 years. It was through a partnership with Wavegarden—one of the world’s premier companies specializing in wave generating technologies—that Coors was able to secure a 14-acre state of the art wave lagoon filled with natural, locally sourced rain water. With multiple zones organized according to the level of difficulty, the NLand lagoon can accommodate up to 120 guests in comfort and style. First timers will find an inviting debut experience at NLand, where more placid white water waves allow guests to glide right over the learning curve and start surfing with confidence. Children, too, will have a blast building confidence and developing their surfing skills on these beginner waves. For the seasoned surf rats, there are a number of specially engineered waves that provide a thrilling and challenging ride guaranteed to satisfy even the most discerning surfers. NLand boasts a fully stocked Surf Shop where you can attend to any and all surfing needs. From boards to GoPros to document your experience, the Surf Shop will provide you with anything you may have left behind before coming to the park. Additionally, both NLand’s own scratch kitchen, Blue Prairie, and Juice Bar provide delicious, nutritious, locally sourced eats to fuel your afternoon activity or help you wind down after a challenging surf. Finally, NLand’s Overlook observation walkway provides a thrilling view of the wave lagoon below for those bystanders who don’t wish to partake in the wet n’ wild activities. With $5 pass options for observers, you can hang out on the shore and enjoy all that sunny Texas has to offer. 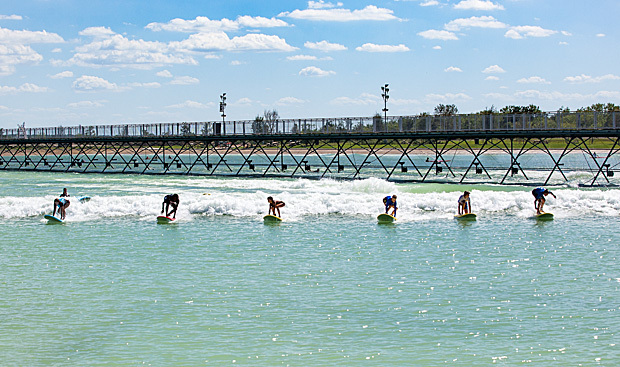 NLand Surf Park, North America’s premiere surf park, is located at 4836 E Hwy 71, Del Valle, TX 78617, ten minutes from Austin Bergstrom International Airport. Stop by and hang ten, friends!